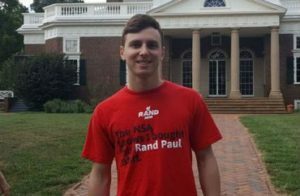 One of the few conservative voices on the Rutgers University student newspaper staff has been fired for his use of the term “illegal alien” in an opinion piece. Khavich was also speaking from the standpoint of an immigrant. Born in Israel, his Ashkenazi Jewish parents fled Belarus in the wake of the Soviet Union’s collapse. The conservative columnist had been criticized for his views. He had also hosted Breitbart’s Milo Yiannopoulos, a Trump supporter, for his first U.S. college event. Khavich demanded that his Oct. 30 column include the phrase “illegal aliens” to describe those in the country illegally. That was the final straw for the Daily’s editor, who said Khavich repeatedly fought over “stylistic” editing changes to his columns over the past several months, according to the College Fix. When Khavich complained to his editor about the edited draft, she said the “illegal” edit came from the top: Editor in Chief Dan Corey wanted the column to follow Associated Press style. The AP Stylebook was revised three years ago to disapprove of using “illegal” to describe a person, as opposed to an action, after having affirmed “illegal immigrant” just a year earlier. His editor was “not happy” after being confronted, Khavich said, and he was fired the next day.